Ibrahim Al-Akhdar was born in Medina, Saudi Arabia, in 1364 Hijri (1945). Al-Akhdar received a religious education and entered many religious schools to accomplish his educational process such as Dar Al Hadith. In parallel, Ibrahim memorized the Quran by eminent teachers like Omar Al-Haydari, Sheikh Hassan Ibrahim, Sheikh Amir Bin Sayed `Uthman, and Sheikh Ahmed Bin Abdul-Aziz Al-Zayat. He also studied the Aqidah, Fiqh and took language courses from Sheikh Abdullah Bin Mohamed Al-Ghuniman. 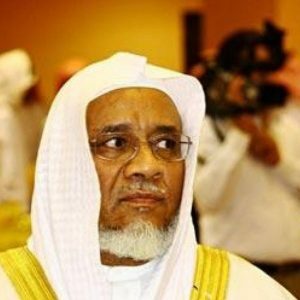 Ibrahim worked as teacher in Ubai ibn Ka`ab School for memorizing Quran in Medina and then led prayers as imam in the Grand Mosque of Jeddah. He was also hired as teacher in the Faculty of Quran and the Faculty Dawah of the Islamic University in Medina. He also studied at the Scientific Institute of Islamic Dawah relevant to the Imam University. Since 1406 Hijri (1986) and for nine years, Sheikh Ibrahim was one of the imams of the Prophet’s Mosque. Sheikh Ibrahim contributes widely to the Quran Memorization activity in Saudi Arabia and in many committees, and associations such as the Charitable Association of Social Services; the National and International Jury of the Quran competition. Sheikh Ibrahim Al-Akhdar attended many Television and Radio programs, and gave lectures in many scientific meetings. His recitations discography is present in many Islamic libraries all over the world.